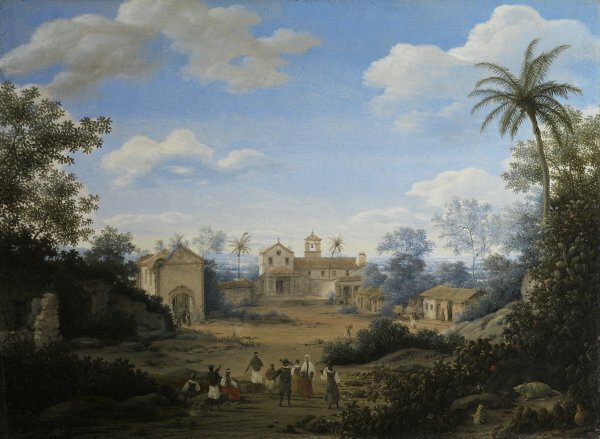 Frans Post made a lifelong career of painting freely recollected, nostalgic images of Brazil based on his seven-year-stay (1637-1644) in South-America. The chronicler of artists' lives, Arnold Houbraken, reports that Frans was recommended by his brother, Pieter Post, to accompany Johann Maurits van Nassau-Siegen on his expedition to Brazil, where the latter had been appointed Governor General. While the painter Albert Eckhout recorded the native people, flora and fauna of the region, Post concentrated on the landscape, terrain, plantations and settlements. He executed sketches on the spot as well as paintings, one half dozen of which have survived. However most of Post's known oeuvre post-dates his return to his native Holland. While ironically the paintings from his brazilian period employ the muted palette and atmospheric effects of the Dutch "tonalist" manner in which Post was trained in Holland, his later works exhibit sharper, bolder contrasts, detailed colour, and a tripartite division of the landscape that recalls 16th century conventions. Post often separates his scenes into striated zones corresponding to fore-, middle-, and background, which are dominated respectively by a lush jungle green, brown and beige hues, and, toward the distant horizon, hazy blues. The present painting is typical of the carefully ordered panoramic views with bracketing coulisses (the tall trees and "wings" of dark foliage to either side) that Post perfected in his maturity. The buildings in the middle distance are the crumbling Church of St. Cosmas and St. Damian on the left, and on the right, the Franciscan Monastery at Igaraçu. Post undoubtedly recorded Igaraçu in first hand sketches (now lost), which he then developed into finished drawings the year after his return to the Netherlands; see the series of 32 sheets, several of which are signed and dated 1645, now preserved in the British Museum, London. In turn the finished drawings served as models for the etched illustrations in Barlaeus' Historia de rerum per octennium in Brasilia (1647). 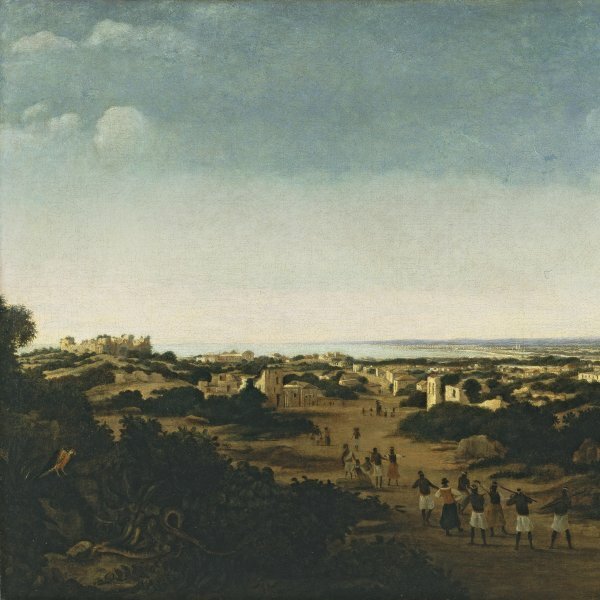 However, just as Dutch land -and cityscapists like Jacob van Ruisdael and Jan van der Heyden took liberties with actual topography and buildings, so too Frans Post undoubtedly altered and rearranged the architecture and setting of Igaraçu. For example, his four other images of the Church, all depict the structure without the Monastery and with different buildings surrounding it. Furthermore, Post's two other paintings of the Monastery freely shuffle and rearrange its architecture. Especially after so many years, Post may have felt that topographic accuracy was less important to his viewers than the evocation of a sense of place, namely a far-off land of exotic plants and animals, picturesque ruins and architectural amalgams of European traditions and local building styles, and vast stretches of fertile countryside. By inventorying the native creatures (note the armadillo and giant toad in the right foreground), vegetation, fruit and flowering plants, as well as the local peoples (representatives of all three races who inhabited Brazil at this time appear in the centre: black Africans, native Indians, and a European), Post offered a fictive but encyclopedic account of one corner of the New World, thereby fulfilling his patrons' expectations. De Sousa-Leão rightly complimented the present work as "One of Post's most attractive paintings." Its bright crisp style and fully assured technique are most characteristic of the artist's later style from 1660 or thereafter. Ironically, the Netherlands had relinquished control of Brazil back to the Portuguese in 1654. Thus Post's late paintings can be seen in one sense as compensation for loss and a reassertion of the global reach of the Dutch trading empire.